The Audi e-tron Spyder has electric motors driving the front wheels and a twin-turbo diesel V6 powering the rear wheels. 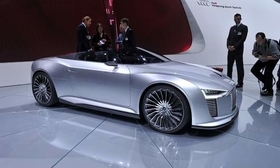 PARIS -- Audi's e-tron electric sports car caught a lot of attention at the Detroit auto show in January. Now the e-tron is back, at the Paris show, without a roof, but with the addition of a twin-turbo V6 diesel behind the seats. Electricity still plays a major role in the e-tron Spyder -- the front wheels each have an electric motor for propulsion. The e-tron Spyder comes in at 71 inches wide, 160 inches long and only about 44 inches high. That's longer and wider than the hardtop version. Audi says it highlights the sportier design and overall appearance of the car. The open-top vehicle features frameless side glass that tapers down toward the rear. The windshield combines with the side glass to emulate the profile of a racing helmet's visor. The front view of the e-tron is characterized by a sharp, sweeping line that identifies the car immediately as a four-ringed Audi. The angled front end gives the e-tron a sporty, wedge-like look and features two cooling intakes for the electric motors. Like today's Audis, the headlights are ultra-efficient light emitting diodes. Audi's trademark four rings fold away exposing the charging station for batteries. A display showing the charge level and a map graphic indicating the current range is also under the panel. Behind the seats of the e-tron are two cowls that act as cooling vents for the diesel engine and hide roll bars that pop up in the event of an accident. The concept car wears 20-inch wheels with a similar look to the coupe concept, but transformed into a three-dimensional turbine design. The rims are made of lightweight aluminum and carbon and are comprised of 66 individual components. No word has been given on power and torque numbers for the e-tron Spyder, or electric range, but with a twin-turbo diesel and two motors up front it is expected to be quick with loads of torque low in the rev range.